A skill is something that sets you apart from the crowd, something that opens doors and leads you to new opportunities. 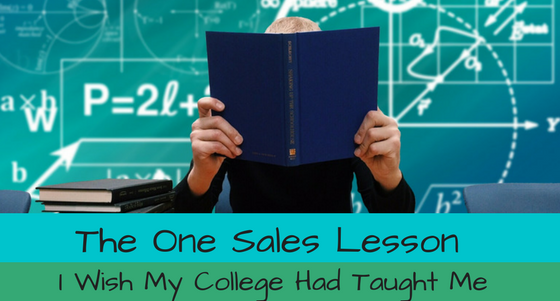 Back when I first started in sales, I was a completely different salesman than I am now. Experience, of course, has played a key role in my junior-to-senior transformation, but looking back, it isn’t just me who’s changed. It’s also the world of sales itself that has undergone some serious shifting. With that as background, I’d like to talk about college for a moment. College teaches you to engage in well-crafted dialogue. It teaches you to take critique like a champ and learn to improve based on acquired knowledge. It gives you lessons on how to cooperate with people, and to find common ground, regardless your differences. College forces us all to acquire some basic skills to express ourselves in a spoken as well as written form, and it also gives us a hard lesson on the importance of persistence. All of that is extremely important to make it in the world. But the one thing our schools have been failing to teach us, and often still are, is the skill to sell. I’m not talking about selling in the way you may be thinking. I’m talking about selling in the non-traditional meaning; the selling we all do in order to get a job, get a date, or convince the neighbors that your daughter will be a great babysitter: selling ourselves, our skills, and our know-how. Everybody says that we’re currently living in the time of the “generation me”, the time of self-centeredness and egoism. I’m actually pleased to hear that. It means that young people these days realize that they must not only know how to do something well, but also have the ability to convince others that they have that know-how. And I wish I knew about that back when I was their age. Whether you’re a professional salesperson or not, the one bit of advice I’d give everyone is this: learn to sell yourself. We’re all doing it anyway. Some of us are doing it better than others. But, no matter what you do in life, I guarantee you’ll be better at it if you learn to sell yourself.